Mid 18th c, camphor wood, natural color pigments, Hunan Province. The qilin in Chinese folklore is the son of the dragon; with the curly hair on top of its head, it is also known as the lion-dog, the protector of the universe. 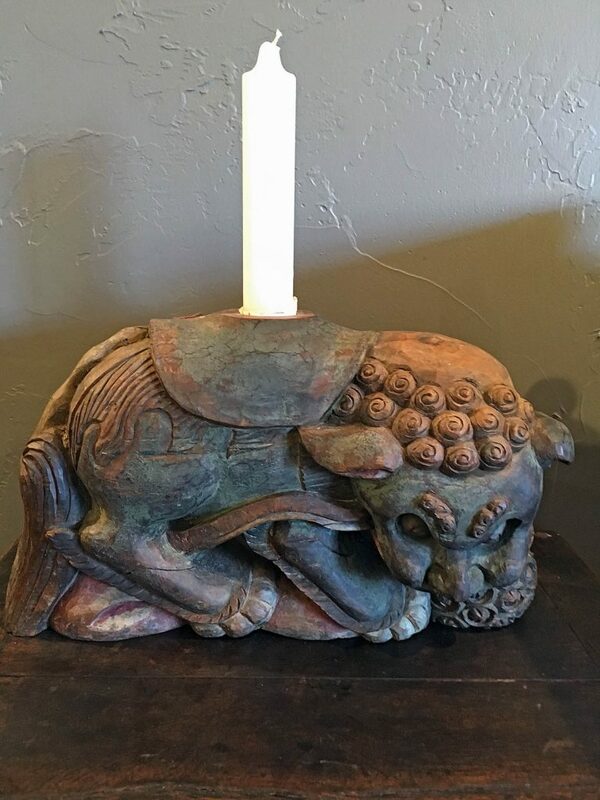 This qilin is beautifully deep-carved with a saddle on its back and a hole for a candle. Its front paws hold a ball, symbol of the universe. It is painted with multi-color mineral pigments, which is usually applied to religious auspicious objects in China, especially if they were to be placed in a chapel or temple. The pigments have faded slightly with age. In China, a qilin is made an emblem of a high ranking official. It is also a symbol of steadfastness, beneficence, and good fortune, and has been much revered by the Chinese. This carved figure was discovered in Hunan and became part of our collection in the 1900s. It survived a cultural revolution in excellent condition. The slightly faded mineral colors attest to its antiquity. It is a unique collector’s item.